What Is A Joule? Or a Watt, Volt, or an Amp? JOULE: One joule (symbol: J) is defined as the amount of work done by electricity. Technically it is the work required to continuously produce one watt of power for one second; or one watt second (W*s). One kilowatt hour (a common electric company measure) equals 3,600,000 Joules (1W*s x 1,000 x 3600 seconds). The Wattage, Current (Amps), Ohms, and Voltage For A Device! AMP (Ampere): In practical terms, the ampere (symbol: I) is the amount of electrical current passing through a conductor (a wire). Technically it is a measure of the amount of electric charge passing a point per unit time. Around 6.242 × 1018 electrons passing a given point each second constitutes one ampere. You can figure out the Amps being use by dividing the Wattage by Voltage. A 100W light, in a typical house (120V) uses 1.2A. VOLT (Voltage): The volt (symbol: V) is the unit of electromotive force measurement, commonly called "voltage". Technically, the volt is defined as the value of the voltage across a conductor when a current of one ampere dissipates one watt of power in the conductor. For example, if you know a TV uses 295 Watts and uses 2.45 Amps, you can calculate the voltage is 120 Volts. OHM: The ohm (symbol: Ω or R) is the unit of electrical impedance in AC, or, in the direct current case, electrical resistance. It is the resistance of material to electrical current. 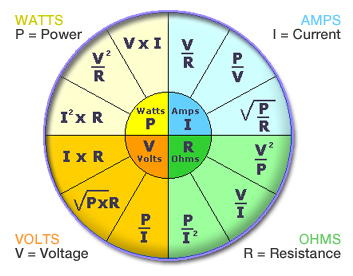 The higher the value, the higher the resistance, and the more voltage is required, and the more current used. Most home speakers are low resistance, just 8 ohm. Technically, the ohm is defined as the resistance between two points of a conductor when a constant of 1 volt is applied, and produces in a current of 1 ampere. DECIBEL: The decibel (dB) is a logarithmic unit of measurement that expresses the magnitude of a physical quantity (usually power or intensity) relative to a specified or implied reference level. The decibel is useful for a wide variety of measurements (particularly acoustics and electronics). It has a number of advantages, such as the ability to conveniently represent very large or small numbers, in a scaling that roughly corresponds to the human perception of sound and light. It is frequently seen in Home Theater Receivers to represent amplification or volume. Since it is based on a reference level, it is not easily used by the non-engineer, but simply as a specification value. Two elements are said to be in series whenever the same current physically flows through both of the elements. The critical point is that the same current flows through both resistors when two are in series. The particular configuration does not matter. The only thing that matters is that exactly the same current flows through both resistors. Current flows into one element, through the element, out of the element into the other element, through the second element and out of the second element. No part of the current that flows through one resistor "escapes" and none is added. This figure shows several different ways that two resistors in series might appear as part of a larger circuit diagram. The other common connection is two elements in parallel. Two resistors or any two devices are said to be in parallel when the same voltage physically appears across the two resistors. Schematically, the situation is as shown below. Here is a page on resistor combination. Doing the calculation for resistors in parallel can be a pain as I found today when referencing Martins chart. I found this site extremely useful. 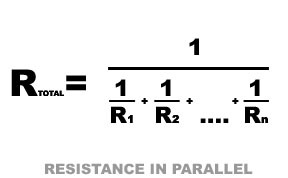 You can calculate the resistance of up to 10 resistors in parallel. A page on capacitance, extremely informative. -A capacitor can store energy, so capacitors are often found in power supplies. -A capacitor has a voltage that is proportional to the charge (the integral of the current) that is stored in the capacitor, so a capacitor can be used to perform interesting computations in op-amp circuits, for example. -Circuits with capacitors exhibit frequency-dependent behavior so that circuits that amplify certain frequencies selectively can be built. Capacitors are two-terminal electrical elements. Capacitors are essentially two conductors, usually conduction plates - but any two conductors - separated by an insulator - a dielectric - with conection wires connected to the two conducting plates. Capacitors occur naturally. On printed circuit boards two wires running parallel to each other on opposite sides of the board form a capacitor. That's a capacitor that comes about inadvertently, and we would normally prefer that it not be there. But, it's there. It has electrical effects, and it will affect your circuit. You need to understand what it does. At other times, you specifically want to use capacitors because of their frequency dependent behavior. There are lots of situations where we want to design for some specific frequency dependent behavior. Maybe you want to filter out some high frequency noise from a lower frequency signal. Maybe you want to filter out power supply frequencies in a signal running near a 60 Hz line. 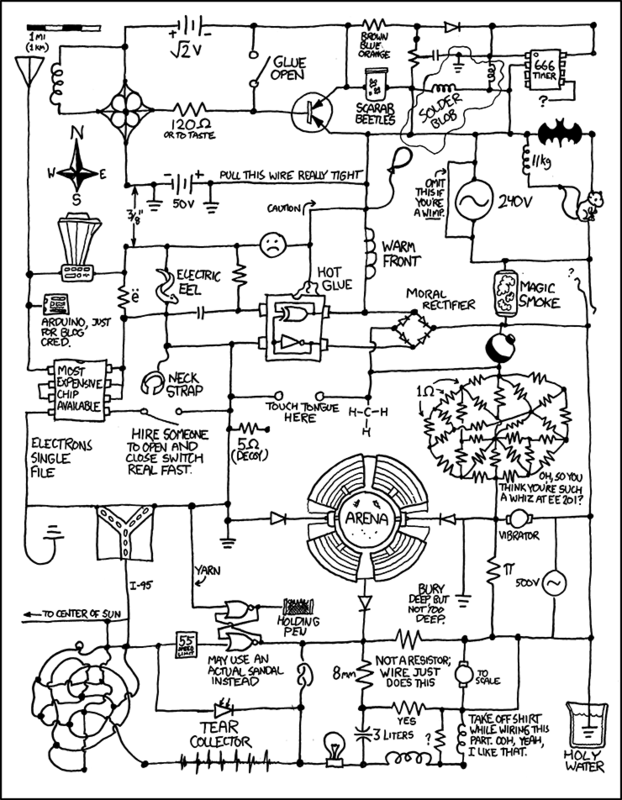 You're almost certainly going to use a circuit with a capacitor. Sometimes you can use a capacitor to store energy. In a subway car, an insulator at a track switch may cut off power from the car for a few feet along the line. You might use a large capacitor to store energy to drive the subway car through the insulator in the power feed. Capacitors are used for all these purposes, and more. In this chapter you're going to start learning about this important electrical component. Remember capacitors do the following and more. Capacitors and inductors are both elements that can store energy in purely electrical forms. These two elements were both invented early in electrical history. The capacitor appeared first as the legendary Leyden jar, a device that consisted of a glass jar with metal foil on the inside and outside of the jar, kind of like the picture below. This schematic/picture shows a battery attached to leads on the Leyden jar capacitor. Two conducting plates. That's the metallic foil in the Leyden jar. An insulator that separates the plates so that they make no electrical contact. That's the glass jar - the Leyden jar. The way the Leyden jar operated was that charge could be put onto both foil elements. If positive charge was put onto the inside foil, and negative charge on the outside foil, then the two charges would tend to hold each other in place. Modern capacitors are no different and usually consist of two metallic or conducting plates that are arranged in a way that permits charge to be bound to the two plates of the capacitor. A simple physical situation is the one shown at the right. If the top plate contains positive charge, and the bottom plate contains negative charge, then there is a tendency for the charge to be bound on the capacitor plates since the positive charge attracts the negative charge (and thereby keeps the negative charge from flowing out of the capacitor) and in turn, the negative charge tends to hold the positive charge in place. Once charge gets on the plates of a capacitor, it will tend to stay there, never moving unless there is a conductive path that it can take to flow from one plate to the other. There is also a standard circuit symbol for a capacitor. The figure below shows a sketch of a physical capacitor, the corresponding circuit symbol, and the relationship between Q and V. Notice how the symbol for a capacitor captures the essence of the two plates and the insulating dielectric between the plates. Now, consider a capacitor that starts out with no charge on either plate. If the capacitor is connected to a circuit, then the same charge will flow into one plate as flows out from the other. The net result will be that the same amount of charge, but of opposite sign, will be on each plate of the capacitor. That is the usual situation, and we usually assume that if an amount of charge, Q, is on the positive plate then -Q is the amount of charge on the negative plate. The essence of a capacitor is that it stores charge. Because they store charge they have the properties mentioned earlier - they store energy and they have frequency dependent behavior. When we examine charge storage in a capacitor we can understand other aspects of the behavior of capacitors. In a capacitor charge can accumulate on the two plates. Normally charge of opposite polarity accumulates on the two plates, positive on one plate and negative on the other. It is possible for that charge to stay there. The positive charge on one plate attracts and holds the negative charge on the other plate. In that situation the charge can stay there for a long time. That's it for this section. You now know pretty much what a capacitor is. What you need to learn yet is how the capacitor is used in a circuit - what it does when you use it. That's the topic of the next section. If you can learn that then you can begin to learn some of the things that you can do with a capacitor. Capacitors are a very interesting kind of component. Capacitors are one large reason why electrical engineers have to learn calculus, especially about derivatives. In the next section you'll learn how capacitors influence voltage and current. There is a relationship between the charge on a capacitor and the voltage across the capacitor. The relationship is simple. For most dielectric/insulating materials, charge and voltage are linearly related. V is the voltage across the plates. You will need to define a polarity for that voltage. We've defined the voltage above. You could reverse the "+" and "-". Q is the charge on the plate with the "+" on the voltage polarity definition. C is a constant - the capacitance of the capacitor. The relationship between the charge on a capacitor and the voltage across the capacitor is linear with a constant, C, called the capacitance. When V is measured in volts, and Q is measured in couloumbs, then C has the units of farads. Farads are really coulombs/volt. The relationship, Q = C V, is the most important thing you can know about capacitance. There are other details you may need to know at times, like how the capacitance is constructed, but the way a capacitor behaves electrically is determined from this one basic relationship. Shown to the right is a circuit that has a voltage source, Vs, a resistor, R, and a capacitor, C. If you want to know how this circuit works, you'll need to apply KCL and KVL to the circuit, and you'll need to know how voltage and current are related in the capacitor. We have a relationship between voltage and charge, and we need to work with it to get a voltage current relationship. We'll look at that in some detail in the next section. This relationship is the fundamental relationship between current and voltage in a capacitor. It is not a simple proportional relationship like we found for a resistor. The derivative of voltage that appears in the expression for current means that we have to deal with calculus and differential equations here - whether we want to or not. Storing energy is very important. You count on the energy stored in your gas tank if you drove a car to school or work today. That's an obvious case of energy storage. There are lots of other places where energy is stored. Many of them are not as obvious as the gas tank in a car. Here are a few. You're reading this on a computer, and the computer keeps track of the date and time. It does that by keeping a small part of the computer running when you think that the computer is turned off. There's a small battery that stores the energy to keep the clock running when everything else is turned off. If you own a stereo or television that you have to plug into the wall plug, then you should realize that the wall plug voltage becomes zero 120 times a second. When that happens, the system keeps running because there are capacitors inside the system that store energy to carry you through those periods when the line voltage isn't large enough to keep things going! Capacitors can't really be used to store a lot of energy, but there are many situations in which a capacitor's ability to store energy becomes important. In this lesson we will discuss how much energy a capacitor can store. Capacitors are often used to store energy. When relatively small amounts of energy are needed. Where batteries are not desired because they might deteriorate. For larger power/short duration applications - as in power supply filters, or to keep power up long enough for a computer to shut down gracefully when the line power fails. To calculate how much energy is stored in a capacitor, we start by looking at the basic relationship between voltage and current in a capacitor. Once we have this relationship, we can calculate the power - the rate of flow of energy into the capacitor - by multiplying the current flowing through the capacitor by the voltage across the capacitor. We can recognize that power is simply rate of energy input. Now, the derivative of energy can be integrated to find the total energy input. Now, assuming that the initial voltage is zero (there is no energy stored in the capacitor initially, we find that the energy stored in a capacitor is proportional to the capacitance and to the square of the voltage across the capacitor. The expression for the energy stored in a capacitor resembles other energy storage formulae. For kinetic energy, with a mass, M, and a velocity, v.
For potential energy, with a spring constant, K, and an elongation, x. Since the square of the voltage appears in the energy formula, the energy stored is always positive. You can't have a negative amount of energy in the capacitor. That means you can put energy into the capacitor, and you can take it out, but you can't take out more than you put in. Power in to the capacitor can be negative. Voltage can be positive while current is negative. Imagine a capacitor that is charged. You could charge a capacitor by putting a battery across the capacitor, for example. Then, if you placed a resistor across the capacitor, charge would leave the capacitor - current would flow out of the capacitor - and the energy in the capacitor would leave the capacitor only to become heat energy in the resistor. When energy leaves the capacitor, power is negative. When you use capacitors in a circuit and you analyze the circuit you need to be careful about sign conventions. Here are the conventions we used, and these conventions were assumed in any results we got in this lesson. We start with a capacitor with a sinusoidal voltage across it. Comparing the expressions for the voltage and current we note the following. The voltage and the current are both sinusoidal signals (a sine function or a cosine function) at the same frequency. The current leads the voltage. In other words, the peak of the current occurs earlier in time than the peak of the voltage signal. The current leads the voltage by exactly 90o. It will always be exactly 90o in a capacitor. Now, with these observations in hand, it is possible to see that there may be an algebraic way to express all of these facts and relationships. The method reduces to the following. If we have a circuit with sinusoidally varying voltages and currents (as we would have in a circuit with resistors, capacitors and inductors and sinusoidal voltage and current sources) we associate a complex variable with every voltage and current in the circuit. The complex variable for a voltage or current encodes the amplitude and phase for that voltage or current. The voltage and current variables can be used (using complex algebra) to predict circuit behavior just as though the circuit were a resistive circuit. We need to do two things here. First, we can illustrate what we mean with an example. Secondly, we need to justify the claim above. We will look at an example first, and we will do two examples. The first example is jsut the capacitor - all by itself. The second example will be one that you have considered earlier, a simple RC low-pass filter. Where j is the square root of -1.
and the quantity 1/jwC is called the impedance of the capacitor. In the next section we will apply that concept to a small circuit - one you should have seen before. Before moving to the next section, a little reflection is in order. Here are some points to think about. A phasor summarizes information about a sinusoidal signal. Magnitude and phase information are encoded into the phasor. Frequency information is not encoded, and there is a tacit assumption that all signals are of the same frequency, which would be the case in a linear circuit with sinusoidal voltage and current sources. We looked at a case where we encoded a signal Vmax sin(wt) into a phasor of Vmax/0o. That was completely arbitrary, and many others would have encoded Vmax cos(wt) into a phasor of Vmax/0o. Phasors are intended only to show relative phase information, and it doesn't matter which way you go. In the last section we began to talk about the concept of impedance. Let us do that a little more formally. We begin by defining terms. Next, we can use the relationships for voltage and current phasors to analyze a circuit. Here is the circuit. Now, this circuit is really a frequency dependent voltage divider, and it is analyzed differently in another lesson. However, here we will use phasors. At the end of this analysis, you should compare how difficult it is using phasors to the method in the other lesson. We will use the current phase as a reference, and measure all other phases from the current's phase. That's an arbitrary decision, but that's the way we will start. Next we note that we can compute the voltage across the capacitor. This expression relates the current phasor to the phasor that represents the voltage across the capacitor. The quantity 1/jwC is the impedance of the capacitor. In the last section we justified this relationship. We can also compute the phasor for the voltage across the resistor. This looks amazingly like Ohm's law, and it is, in fact, Ohm's law, but it is in phasor form. For that matter, the relationship between voltage and current phasors in a capacitor - just above - may be considered a generalized form of Ohm's law! Now, we can also apply Kirchhoff's Voltage Law (KVL) to compute the phasor for the input voltage. You should note the similarities in what happens here and what happens when you have two resistors in series. If you have a resistor, R, and a capacitor, C, in series, the current phasor can be computed by dividing the input voltage phasor by the sum of R and 1/jwC. If you have two resistors in series (call them R1and R2), the current can be computed by dividing the input voltage by the sum of R1and R2. yeay! scientific evidence that my sh** will work! Yeah those resistors are tricky. Looks like that site has some good circuit info.